Prithvi comes and gets tensed seeing Karan and Preeta, he says that they are here, Sanju tries to plan saying that he will kill them but Prithvi stops him, Doctor asks if they can have water, he says that they will have it themselves, they leave and make a plan to get out of the house and run away. Sherlin says to Prithvi that they will ask the doctor to go and send them both away but he says that the doctor will tell them the truth, they agree that they will stay inside, Sanju says that he will go and kill them but Sherlin takes it from him and says that he cannot take it to kill them, she says that they have given him the money and so he must stay inside. Preeta asks Karan to stop saying that she feels that the Doctor does not want to talk to them as she is feeling guilty because she lied in front of everyone and now doesn’t want to talk to them, Karan starts to call the police, no one picks he call he gets frustrated, he starts to knock again, Preeta asks him to calm down and come with him as she has a plan, he ask her, she says that there must be a copy of Sherlin’s reports with Bahavna as the hospital keeps one for record so they must go and get them, Sherlin hears them and gets worried. 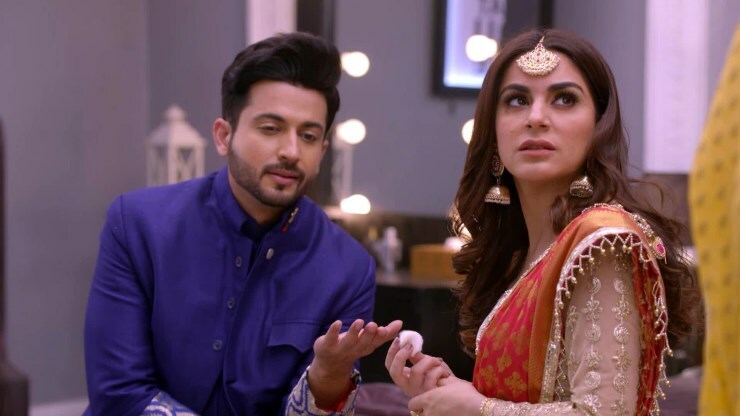 Prithvi and Sanju are arguing, they come and ask her the reason for being worried she tell that they both have gone to the hospital to get the copy of her reports. Sanju realizes that the doctor is missing, they all search the house but are unable to find them both, Sherlin says that she knows a way where they could have gone, they go to look at that place, they enter the room, Sanju make fun of Sherlin that she should not attempt suicide, they both starts to argue, Prithvi gets annoyed and so to make them both calm down he breaks a vase, asking her as to what she wanted to tell them , Sherlin heads to the window, they all get shocked to see that Doctor escaped. Sherlin tells him that they must go to the hospital. Sherlin says that they have the last clue to her pregnancy, he says that they have done it and that he has the cleverest girl with him, he says that he was able to do it because she called the nurse after keeping a cloth on her face. Sherlin says that they must take care of Doctor Semma but Prithvi says that they must not worry as Sanju is going to kill them both, he will not even take money from them as they are also his enemy, Prithvi says that he is feeling very good and now everyone will face failure in front of them, Sherlin says that the Luthra’s will be ashamed inform of her that they thought that shew was pregnant, she hates them even more and will make them pay after she gets married with Rishab, Prithvi says that she must focus on keeping Karan and Preeta way from them both, they are the worst enemies, they must make them pay , Sherlin and Prithvi agree to make lives of everyone miserable. they think that _Preeta is trying to marry Rishab and so she wants that their engagement gets broken, Preeta hugs her, Sarla says that she knows this but Luthra’s do not believe her and Karina does not like her, she is trying to degrade Preeta. Preeta says that she will tell Sarla everything she knows, Sherlin is not a good girl and she is having an affair with some other girl and if she marries Rishab then she will destroy his life because he is such a simple man. Sherlin is with some other guy and is also going to be the mother of that person, Karan and herself always got some clue but were not able to prove it and how can she let her destroy the life Rishab as they both have done lot for them, they also jumped into the fire for her, Sarla says that she knows this. Preeta then says that the doctor also said the truth regarding Sherlin but lied only because she was in some pressure. They both are only trying to save Rishab from this danger as she is having an affair with some other guy and is also hiding that she is pregnant and she knows this because of the doctor, she tries to convince Sarla to make everyone realize the truth regarding Sherlin and they must believe that Sherlin is a bad girl, Sarla gets angry asking Preeta if she knows what she is saying as she wants that Preeta live a happy life, she knows what she is saying as Sarla wants to live a life that is not filled with hatred, Preeta says that she knows that what the Luthra’s said was wrong but she will see that after some days they will get okay, Sarla says that she will not be able to bear when someone says such big things, Preeta says that they were in anger, Sarla says that someone never says things like this in anger. Sarla say that Preeta as talking just like Pragya, and it is her fault as Pragya also kept everyone above her, she will not let the same thing happen to her what happened to Pragya, she will not go to the house every again, she says that she will not go, will happen if Dadi need her, Sarla say that they will arrange for some there doctor and she will not go, Sarla doesn’t hear anything that Preeta has to say, She says that she has the right to take at least one decision of her life, saying this she leaves, Preeta hugs her Dadi. Rishab is walking and thinks of all that Karina said and I very angry, Karan walks in and picks up the pillow, he asks Rishab what the matter is, he gets angry and says a lot to Karan asking him the reason he did not take him into confidence even when he said, Rishab says that it was because he could have handled the situation and kept everyone from saying things that they have because of Karan, he feels bad for Preeta, wondering why she has been barred from coming to their house when Karan was with her in the plan. He says that Sarla also wants that they make arrangement for their Dadi as she will not let her come to their house, he says that he would have told him the truth as he is feeling bad because Preeta was blamed because of him, Karan tries to explain but Rishab does not listen and asks him to leave. Sherlin asks in amazement from Karina if Preeta will never come, Karina says that she has made sure that Preeta will never come to their house, Shel45rin hearing this get excited, Karina gets a call, Sherlin thinks that now she is happy as she will marry Rishab without any worry. Shristri comes to Preeta asking about what the problem is, Shristri says that when Preeta smiles she feels happy knowing that she is happy but when she is crying Shristri also feels bad and gets heartbroken, Preeta says that she is fine, Shristri disagrees saying that she knows that she was attached to Dadi and she knows how hardships she faced when she first went to their house to help Dadi. Preeta says that she only wants their mother to be happy and whatever she said to them is for their own benefit and she will never do anything that will hurt them, Preeta sees Sarla standing in the corner, they all share a hug. Prithvi is clean9ing his wounds, he hears a knock on the door, running for his gun he thinks that all of his enemies are now defeated, he opens the door and it is Sherlin who says that she has to say something important, he is very excited to hear what she has to say, she tells him that Preeta will n0pt come to Luthra’s house anymore as Karan has told this to her, He says that this will not happen and she will come back to their house, everything will be like before she says that Rakhi has also told her to not come to their house anymore. is really lying, she asks him to break their engagement at this very moment, he denies it at first but then she forces him and he starts to leave unwillingly. Karan is in his room thinking of what Rishab said that he was also the one responsible for all the mess and why does Preeta have to face all the trouble, he gets a call from Preeta who starts to talk with him and she says that she will not co me to their house anymore. He says that she must not do this as |Dadi needs her, and will she listen to Sarla which Preeta says that she is a doctor but first a child of her mother and she will not do anything that is against the wishes of her mother, he begs her to not do anything of the sort and come back, Preeta says that she will no0t come back and will find a new job, he says that he will recommend her but she stops him, saying that she will do it by he own, she gets called in, before leaving she wishes Karan luck for his matches and he also wishes her luck.